See scan - perfect condition. This is an absolutely scarce and rare WWII NAZI Germany Reichsmarschall Hermann Göring's wife Emma Goering / Göring sterling silver teaspoon. The spoon is marked at back WMF and 800 silver content and in fact is very unusual custom order as WMF normally did not produce silverware. 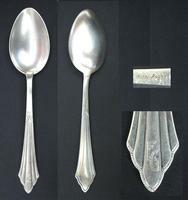 Emma Goring's monogram cypher initials are finely engraved at handle of the spoon.Its a nice piece measuring about 140mm in length and weighing approximately 25 grams of silver. The wife of Adolf Hitler Eva Braun also possessed similar silver teaspoons with her engraved initials and recently these reach sky high prices per piece. Scarce militaria / military and historical collector piece and one of the rare silver teaspoons as part of the NAZI German leaders personal pieces of silverware.